My wife, Suzan Haskins, and I do a lot of traveling. So we often find ourselves on the way to places. We find ourselves in airports. In taxis and shuttles. In planes and buses. In snow-bound cities and towns for holidays and family functions. I deal with these situations the same way a lot of people I know deal with them. In my mind, I go back to the island. That’s why I can sit in the middle of a restless crowd at the boarding gate of a flight that’s already been delayed twice with the prospect of missing my connection or having to spend the night in an airport hotel with my eyes closed and a big smile on my face. Suzan and I spent a lot of time on a lot of islands even before we started working for International Living. Back in the day, we were avid scuba divers. 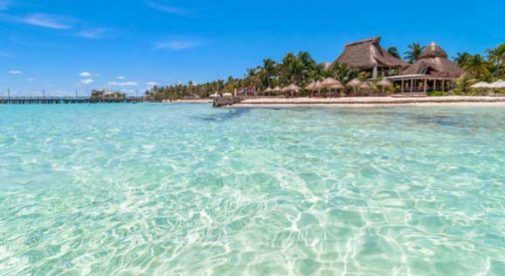 We lived for gin-clear water during the day and palapa bars at night. Most of our vacations were spent that way, and we vacationed on some of the most beautiful tropical islands on the planet. It was probably this experience that got us interested in International Living in the first place. The prospect of actually living on one of these island jewels instead of simply vacationing there fueled our desire to see just what the prospects really were for living and working abroad. Fifteen years later, we’ve been there and done that. We’ve discovered that it is not only possible to live on a tropical island paradise…it can actually be part of a plan to live a happier, healthier life for far less money than possible back in the Frozen North. There are many beautiful islands that can offer you the best of island living while still being affordable enough to live there full-time. So I have quite a collection of memories of sandy beaches, waving palm trees, sparkling turquoise waters, and funky little beach bars to draw on when I need to get away for a few minutes…or hours. Isla Mujeres. Cozumel. 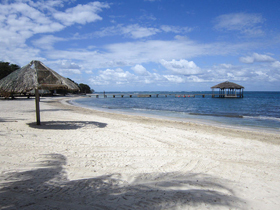 Roatán. Caye Caulker. The Pearl Islands. Eleuthera. Phi Phi. Dozens more…I can conjure them up anytime I need to, in the back of a taxi stalled in city traffic or a bus trundling down the highway at night, or looking out a hotel window at a wind-swept sea of frozen Midwestern farm fields stretching to the horizon. I know those warm, lush islands are there…I’ve dived from them. I’ve partied on them. And I’ve written about them, talking to and interviewing hundreds…thousands…of people over the years who have successfully made them their full-time homes. Not only can it be done, it has been done. And it is still being done right now by people with a sense of adventure and the right information. And it will no doubt be done again, sometime over the next few weeks, in the mind of that tall guy you see standing in line at some crowded airport boarding gate with his eyes closed and that beatific smile on his face.